UK.gov bods have been stripped of access to services for the emerging non-terrestrial standard XTML, beamed in by little grey vendors A51 Technologies, following an El Reg probe. 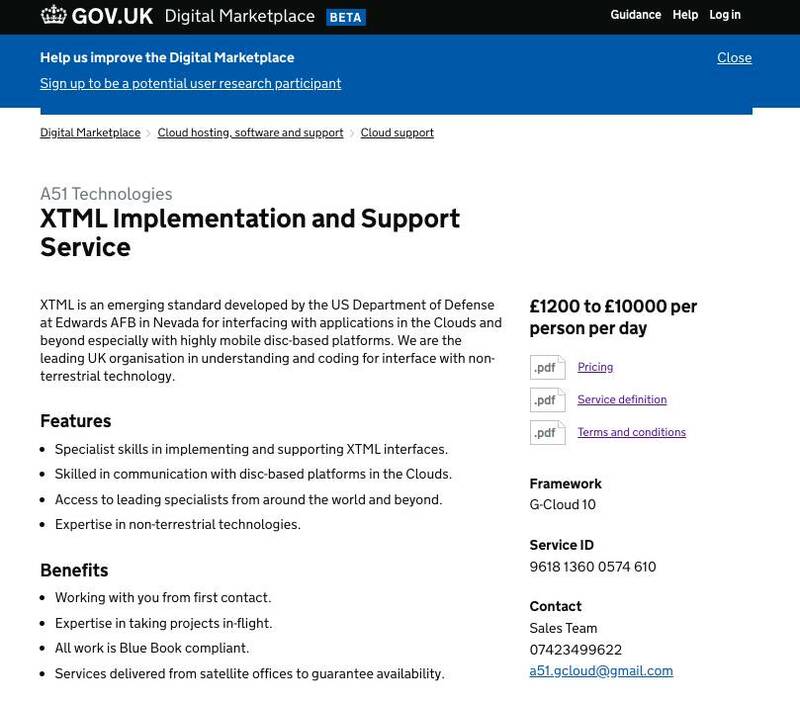 The "extra-terrestrial markup language" implementation and support service was listed on the Digital Marketplace by A51 Technologies, as part of the coveted G-Cloud 10 galaxy. The out-of-this-world listing describes XTML as "an emerging standard developed by the US Department of Defense at Edwards AFB in Nevada for interfacing with applications in the Clouds and beyond especially with highly mobile disc-based platforms". According to the listing, XTML is "a custom extension of XML incorporating multi-dimensional elements, including non-standard language and character sets". The imaginative types at A51 said that for UK civil servants planning to migrate to XTML, implementation teams will be made up of "leading specialists from around the world and beyond". Support for Earthlings' existing solutions will be from A51's "grey men" team, "who provide a wide range of non-verbal support", while new-builds will have access to the "little green men" team. The firm – clearly not grasping the gravity of the situation for many a stressed out sysadmin – boasts of response times "within 1 lunar month". It also pledges remote services from "satellite offices", although it can also help by "beaming a specialist engineer direct into customer organisations". A51 added that there are "virtually no constraints" to the services it can offer: "They are literally out of this world in functionality." Junior developers charge £1,200 a day, and senior devs £2,000 a day (price plan here, PDF). Unsurprisingly, non-terrestrial resources will set you back more, charging £10,000 a day, and anyone interacting with "unconventional" specialists and tech will be required to sign an NDA. There is, though, one word of warning for government departments interested in parting with their cash: "No refunds are provided in the event that communication with non-terrestrial applications is found to be impossible." The Register – having been alerted to the service by a reader* – yesterday asked the Cabinet Office press team about the alien listing. And it seems they took the issue to their leaders, as the plug was quickly pulled on the service (welcome to Whitehall, eh?). "A51 Technologies stopped offering this service on Tuesday 31 July 2018," the banner at the top of the site reads. But not to worry: "Any existing contracts for this service are still valid." When we got in touch with A51 to ask about the service, a Dr Okon responded to say that there had been little in the way of a vetting process, with no one asking any questions of the firm or its service. Asked about the possible SETI-back given that the service has been de-listed, the Doctor remained upbeat: "We'll be back (with another out of this world service) for G-Cloud 11." Hat-tip to the eagle-eyed reader who noticed the framework's unusual non-Terran outsourcing service and informed The Reg. Anyone interested? NHS? Bueller? Bueller?